Has Washington's bubble of optimism about the United States' progress in Iraq been punctured? The signs were there when General David Petraeus, announced a 45-day halt to troop withdrawals from July during highly charged hearings in the Senate in which he faced questions from all three contenders to replace Bush: John McCain, Hillary Clinton and Barack Obama. The halt indicates that US strategy was not successful in gaining some sort of military victory. The hearings showed the deep divide on Iraq between McCain, who favours keeping troops in Iraq until security is established, and the two Democrats (Obama and Clinton) who have sought early withdrawal. Lets call the situation for what it is . Bush's long war on terror is a lost cause. As the war heads towards its second decade, American security policy is in disarray, the Iraq War is a disaster, Afghanistan is deeply insecure and the al-Qaida and Taliban movements remains as potent as ever with new generations of leaders coming to the fore. The New American Century is off to a bad start. Since the 9/11 attacks, many Western governments have assumed terrorism to be the greatest threat the western nation states face. In response, their policies attempt to maintain control and keep the status quo by using overwhelming military force. The US is the central power and nation states like the UK and Australia fall into line and march the military march. 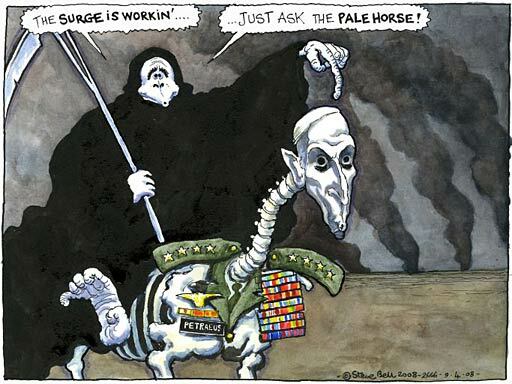 C'mon Gary, Steve Bell - cartoonist - offering serious comment on foreign affairs. Next you'll drag Fraser in here so he can tell us how to fix Zimbabwe. not quite. There are two links as well as a link on the question. The post relies on the work of Paul Rogers at the Oxford Research Group. Zimbabwe looks to be likely to break into civil war. I spoke to a couple today who had recently escaped from South Africa. They say the Zimbabwe people are well received as employees in S.Africa because they are so well educated and speak English eloquently. There is a strange set up in Zimbabwe with electricity coming from S.A because the power stations have fallen into disrepair. They are starting to ration it now and it is off for many hours a day. Seems the power supply was based on the friendship between Mugabe and the S.A leader. When he goes so too perhaps the power. There's no way of rescuing Bush's record as being the worst president in American history short of terrorist attacks on the pyramids, the Great Barrier Reef and the Taj Mahal sometime next week. Zimbabwe can consider itself lucky he didn't decide to rescue them instead. At least Fraser is harmless. There is no value in rescuing poverty. Sorry Gary, I followed the Steve Bell link and read about his background. I in no way question his right to blog and comment but spinning a carapace around his agiprop and calling it serious political comment via cartoons is a bit much. Lyn, there’s no point telling me Fraser is harmless. You need to tell the people of Zimbabwe that in Mugabe, Fraser saw hope for their future and endorsed him. The chance to rescue poverty may have been lost in 1980.
after Dubya has accomplished his goals of creating another Shiite state and increasing the profits of the oil companies, we should get out. I agree with the analysis of Paul Rogers. Climate change and competition for resources are a greater threat to the prosperity of western nation states than terrorism. That is what the links say. It is a serious political point being made; one that is not being discussed in Australia. This 'Fraser bashing' over Zimbabwe is quite ridiculous. And in any case, didn't Mugabe became a liability at least 10 years after the end of White Rule?